In an extraordinary example of superstitious and deceitful reporting, Susan Muthalaly wrote on 4 January 2005 in The New Indian Express, Chennai edition, an article called the “Santhome miracle”. It was a crass attempt by the lady scribe at Christian one-upmanship when the Tamil fisher coast was in crisis from the tsunami. Father Lawrence Raj, the parish priest of the Santhome Cathedral Basilica has been inundated with inquiries about the story of St. Thomas’ miraculous post, supposed to have kept the sea away on December 26. The 450-year-old church, located a few metres from the water, remained unaffected by the tsunamis even though buildings in line with it on either side were ravaged by the waves. The belief, says Father Lawrence, is that when St. Thomas planted the post at the top of the steps leading to the cathedral, he said the sea would not pass that point. Father Lawrence says that for the people who have faith, it would be a miracle. “I believe it is,” he adds. He takes you to the terrace from which he saw the sea in action, as it surged across the road and flooded the huts in front of St. Thomas’ post. It is an innocuous looking log of wood, mounted on a cement pedestal. The real miracle is that nobody has cut this ‘St. Thomas’ pole down and carried it away to their puja room or a European museum! The story goes that a village in the Mylapore area was flooded when a huge tree trunk fell across the river. The local king brought a royal pachyderm to lug it away, but the task seemed impossible. Then St. Thomas came along, removed the girdle from waist and handed it to a bystander and asked him to yank the log with it. He did so and the log moved easily. There is a mural illustrating the episode in the cathedral museum. Father Lawrence says the post is believed to be from that same log of wood. Though there is another story that the post comes from the chapel that St. Thomas built in 74 A.D.
“People have been asking about this story. It has always been around but it is difficult to confirm as fact something that occurred nearly 2,000 years ago. That is why I have been trying to verify the story with other people,” says the priest. Father Lawrence is certainly not alone in believing the story about the safety of his church. Father Lawrence and his reporting scribe Susan Muthalaly are speaking out of both sides of their mouth. According to them, the story of St. Thomas and his miraculous log of wood is true and not true at the same time. Of course, it is not true as they both very well know but are unwilling to say as faithful Christians. Dr. Nagaswami and the Jesuit he worked with also recorded the finding of Buddhist images in the same area. There is no literary or archaeological evidence that a Christian church ever stood at this site prior to the Portuguese occupation of Mylapore. 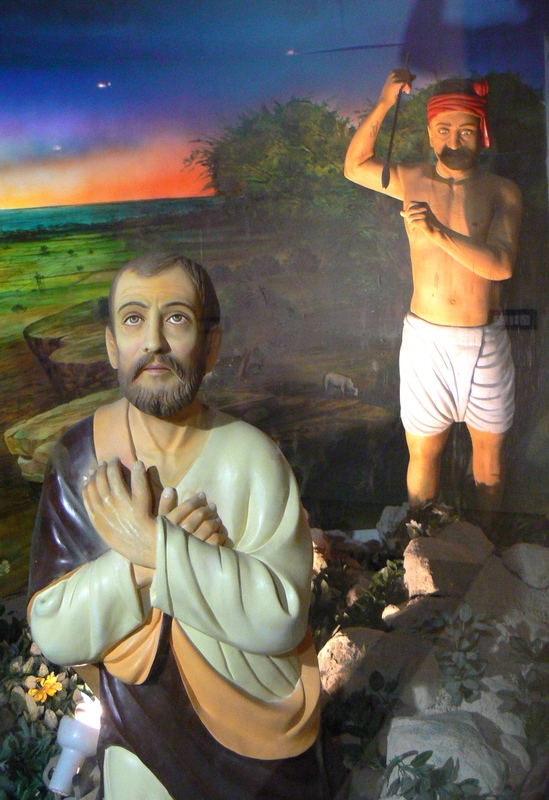 The story of the wooden log which St. Thomas miraculously lifted was borrowed from the Jagannath Puri stala purana and introduced into the Mylapore St. Thomas legend by the Portuguese. The wooden log now standing on the beach at the bottom of the steps leading from the church (which miraculously has not yet been stolen) can be dated by radiocarbon testing, as can the bones in the two alleged St. Thomas tombs. When the dates of these relics have been established by forensic science (as is done with relics in European churches), their true nature and identity can be more easily ascertained. This letter was not published in The New Indian Express and when we realised that the newspaper was not going to allow a rejoinder to its outrageous miracle story, we sent a personal appeal to the Managing Editor M. K. Sonthalia. He had on past occasions shown himself to be a responsible editor of courage and integrity when dealing with the St. Thomas controversy. But this time he was silent. A second appeal was sent to him on January 19th, expressing our dismay at his silence and refusal to accommodate a reply to Susan Muthalaly’s article. We accused him of cowardice and of hiding behind the skirts of philosophy—Indian editors who have read a book or two take refuge in philosophy when they do not want to take responsible action. We also pointed out that Santhome Cathedral Basilica was a monument to religious bigotry not a house of miracles. But the silence continued, and we learned it was the silence of recreance, not philosophy, The managing editor had allegedly come under pressure from his Christian editors and shareholders not to publish our rejoinder, and he had succumbed to their demands even as he had earlier succumbed to their dictate that the popular columnist Francois Gautier be dismissed for his pro-Hindu views. This sad state of affairs at The New Indian Express leads to the larger question of journalistic ethics and integrity. The English-language press in India is politically correct and opportunistic. It is a commercial commodity without ideals. It has no credibility among the informed public because it is wedded to a secularist fundamentalism that is at odds with the spiritual ethos of the Indian people. At the same time it is able to shape public opinion to some extent, and it benefits politically from its morally criminal position of untruth. But one day this will change, and one day the people of Mylapore will learn the true history of the holocaust that took place on their beaches in the 16th century in the name of a malevolent foreign god whose intolerant nature and imperial ambitions were first recorded in the Old Testament. The article “The Santhome miracle” by Susan Muthalaly appeared on 4 January 2005 in the Chennai edition of The New Indian Express. When our response to it was not published, we informed the managing editor of our intention to reproduce the article in full on this web site and asked him to inform us if he had any objection. We have not received any objection from him to date. This entry was posted in apostle, christianity, hinduism, history writing, indian history, ishwar sharan, madras, mar thoma, media, mylapore, religion, san thome, st. thomas, thomas the apostle and tagged chennai, christianity, colonialism, hindu temples, hinduism, indian history, ishwar sharan, madras, mylapore, religious history, saint thomas, san thome cathedral, st. thomas apostle, temple breaking, the new indian express. Bookmark the permalink. Further reading The St. Thomas “Tree” in the Archdiocese of Madras-Mylapore: Genuine or humbug?